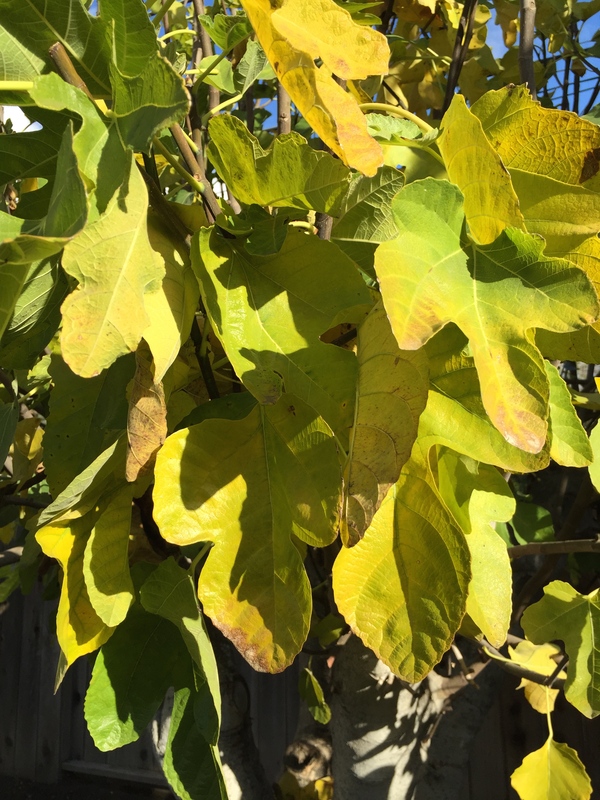 The sun glints off the yellow and green fig leaves in our back yard every morning for the past couple of weeks. Every morning, they are so striking that I want to take a picture of them. It is the same view every day, but I still want to capture it each time I see it. Sometimes I go out in the yard for a close up of a particular leaf; I shoot from different angles, but the feeling is the same: I want to possess this scene. I want to ‘take’ the picture. Make it mine. I have found that painting allows me to put part of my self into what I see, in a different way than photography permits. It was a busy day (it is still Thanksgiving as I write this post). I started my painting this morning before we left for my wife’s cousin’s house for turkey dinner. I finished as much as I could before my self-imposed deadline of midnight. I have tried in the past, to faithfully represent a scene in all its detail. However, nowadays I concentrate more on abstracting one or more aspects of what is before me – an essence, if you will. After selecting a slightly different frame within the photograph, I sketched the placement of the leaves and shadows. Then I painting the negative spaces – the area behind the leaves. I used the Moonglow pigment (Daniel Smith), since it is purpleish, and would contrast nicely with the yellow in some the leaves of the foreground. I painted most of the rest of the leaves with yellows, some with lemon yellow (a greenish yellow) and others with cadmium yellow pale (a more orangy yellow). I planned to return to these areas with different blues to yield greens of different shades, or reds, to impart orange tones to the appropriate parts of the leaves. In the areas I marked for shadows in my sketch, I used a combination of dark green (Shadow green – Holbein) with red, the complement of green. The result was a neutral dark color. I like this study. When I look at it from a distance, I see that the some of the shadows actually appear to be cast by the overlying leaves. This is not obvious when I look at it in close-up. I think that if I apply a wash to each leaf with either a yellow or green glaze, it might serve to integrate the shadow shapes and the different color fields on the same leaf. If this works out, I will provide the updated version in another post. 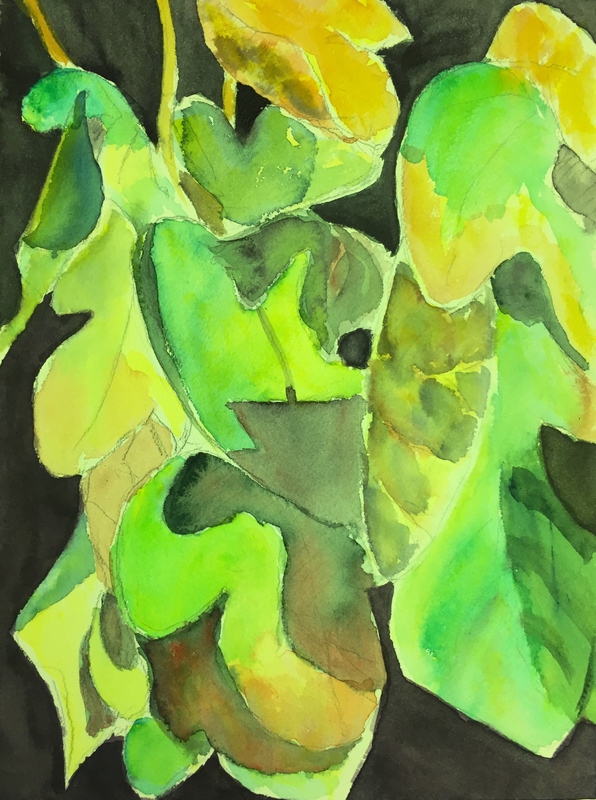 This entry was posted in Personal Stories and tagged abstract art, abstract elements, abstract expressionism, art, artistic process, creative process, creativity, essence, fig leaves, negative space, sketching, visual arts, watercolor. Bookmark the permalink.